Agriculture uses 70% of the world’s fresh water supply, and by 2030, the total demand for fresh water will exceed supply by 40%. In order to sustain the growing population we need to rethink what we eat and how it’s grown. Nearly ninety percent of the Indian population live in areas with some form of water stress or food production deficit. With increasing water scarcity due to frequent droughts and declining land availability for farming, Hydroponics Farming and Soilless AgTech appears to be the need of the hour. What do you need and why do you need it? Hydroponics is the practice of growing plants, food crops or flowers in a liquid medium without the use of soil. Hydroponic crops can be grown in controlled environments, even indoors, year-round, regardless of the outdoor climate, so long as the needs of the crop are met. Plants grown hydroponically uses the same basic elements as plants grown conventionally in soil more efficently: air, water, light and food. The hydroponic grower is to make specific crops have these 4 requirements in the correct proportion. Hydroponics in India is a growing industry, and likely to become even more in demand. The benefits of Hydroponics Farming in India are numerous. In addition to higher yields and water efficiency, when practiced in a controlled environment, hydroponic systems can be designed to support continuous production throughout the year. 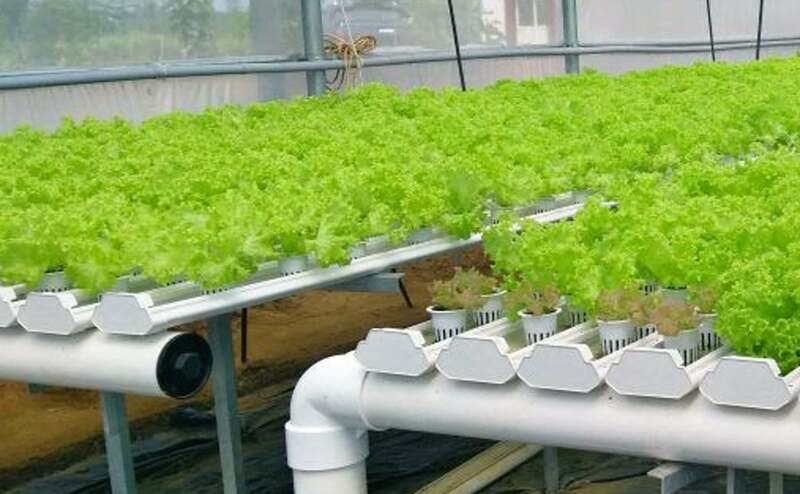 Hydroponics technology in India, in recent years, has become very versatile, ranging from rudimentary home & hobby setups to highly sophisticated commercial enterprise farms. When it comes to Hydroponics Farming in India it is important to look for reliable, experienced and successful Hydroponic Suppliers in India. FutureFarms enables largescale farmers to grow various commercial and specialty crops including leafy greens, lettuce varieties, tomatoes, cucumbers, peppers, eggplants, strawberries, and more. FutureFarms has enabled many growers take that next step, some farms expanding to multi-acre hydroponic productions. FutureFarms provides more than just the systems and supplies. FutureFarms provides a full turnkey hydroponics project management solution including training programs to help the farmer until the first harvest. FutureFarms continues to support the farms by connecting them with a network of world-class suppliers. Partnering with some of the leading greenhouse manufacturers, environmental control manufacturers, input supplies and instrumentations to help growers continue to succeed in the hydroponic journey. With the current sophistication of fertigation systems, instrumentation and technological advancements, the future of hydroponics farming in India appear bright.